When was the last time you phoned up a company to leave them feedback, or even just sent them an email? Can’t remember? Well, you’re not alone. Customers today are turning towards social media instead to let companies know exactly what they thought of their experience. According to a recent study carried out by Conversocial, 43% of customers expect social channels to be integrated with other customer service channels. That means for online businesses today, it has never been more important to pay attention to what customers say on social media and to acknowledge their feedback. 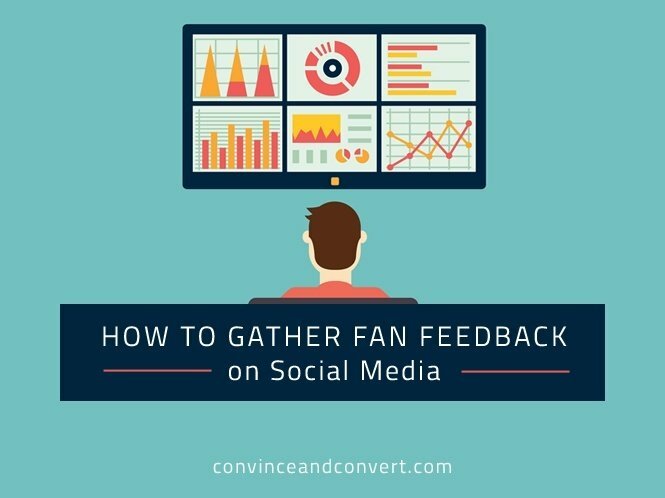 Here’s how your business can gather that feedback using social media, and how you can use it to boost productivity, customer loyalty, and even sales. Before we dive into exactly how your business can gather customer feedback on social media, it’s important to understand why. One of the main reasons your business can benefit from gathering feedback using social media is because, quite simply, your customers are already talking about you. As an online business, it’s your responsibility to ensure you find out exactly where these conversations are happening, so you can join in to either provide support or praise your most loyal fans. But not all of your customers will tweet or even message your brand directly when an issue arises. This is why your business must develop a listening strategy to find out exactly the type of feedback your customers are leaving online and what they are saying when mentioning your company, so you can take the appropriate action. Here are six ways your business can create an effective social media listening strategy in order to gather customer feedback. While this may sound obvious, posing a question to fans via a status update is one of the easiest and quickest ways your business can gather instant feedback on social media. Your fans are already following your business online, as they trust you and feel as if they are getting value from the content you post and share. Not all fans following your company on social media will be open to leaving public and detailed feedback via comments or replies. Some prefer to keep their opinions either low key or completely anonymous. That’s why creating a survey is your perfect solution for gathering customer feedback without spotlighting any customers in the process. Once you have gone over the comments using these three core guidelines, you will begin to notice the key areas in which your business is performing well, as well as areas where it could improve. It’s your job to then check these comments on a daily basis—especially during key campaigns—to gather a better understanding on how your marketing or messaging has been received. 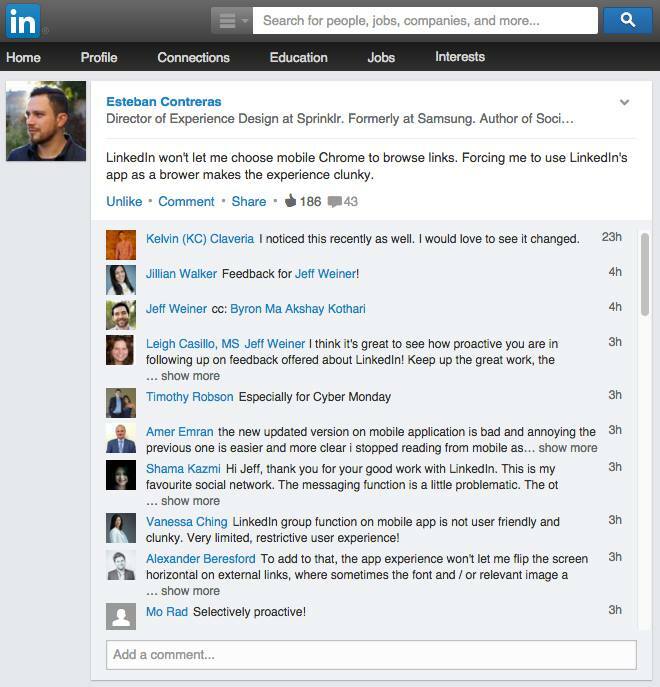 Here’s a great example from the CEO of LinkedIn, Jeff Weiner, who listened to what was being said about LinkedIn by a user, dove in to respond, and alerted his product managers to take action. In a recent study carried out by We Are Social, it’s estimated that close to 1.7 billion people have active social media accounts. For an online business, this can seem pretty daunting when trying to keep up with the never-ending stream of conversations online. That’s why your business needs to utilize social media listening tools to help track the conversations that really matter. Mention, as its name suggests, allows you to track where your company has been mentioned online. You can choose what items you would like the tool to track, be it a keyword, campaign hashtag, or even your company name. The tool will then alert you when those key terms have been used on social media or via blogs and websites. This presents your business with the perfect opportunity to view exactly what others are saying about your business, and more importantly, to join in on the conversation. You can then monitor this feedback and respond to urgent matters without having to spent needless hours searching online. The free version of the tool offers 250 mentions a month, with paid plans offering additional features. Another tool is Hootsuite, which allows your company to track key words, hashtags, and mentions. It also has the added benefit of being able to respond in real time and schedule content directly within the tool itself. Sprout Social also provides powerful social listening, presented in a single feed. Its sleek dashboard offers content scheduling, keyword monitoring for Twitter, free reports for all account tiers, workflow management features, and even a “Discovery” feature that provides follow/unfollow suggestions. These tools are perfect for ensuring your business provides great customer service as well as enabling you to keep up with customers who mention your company online. Remember: Make sure you continuously update the keywords you are searching for in line with recent campaigns or launches. Not all customers will include your brand name in their updates, so having keywords helps identify any missed conversations. Engagement: How many interactions do your posts receive? What kinds of content do your fans engage with most frequently? Exposure: How many people are talking about your business? How many are reaching out directly? 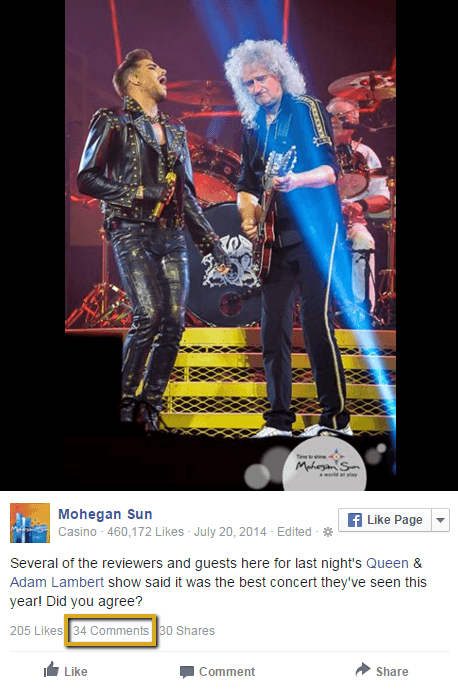 Influence: Where is your brand being talked about, and by whom? How can you capitalize on that influence? By analyzing this data on a regular basis, your business can determine the top pieces of content your community engages with, as well as what topics and discussions spark the most conversation. It’s important you review your social analytics on a weekly basis, at minimum, to help determine any key patterns of behavior and adjust what is and what isn’t working. This will ensure that all content and conversations created by your company are in line with customer expectations, and will therefore have a higher impact. Lastly, when reviewing this data on a weekly basis, you want to keep in mind that no single strategy will work long term. Change the way you create and construct your content on a regular basis to see how this affects engagement and feedback. While it’s important to appreciate your social media community as a whole, you will always find those fans who show that extra passion and commitment towards your business. These are also known as your brand ambassadors—the fans that can’t wait to engage with your content and tell others about what a great job your company does. It’s important to identify these brand ambassadors in your business because they are the ones who are going to give you the most detailed feedback to help improve your overall customer experience, as you have already built up a high level of trust with them. Through your social channels, your company can engage with its brand ambassadors by sending a simple Direct Message, or DM. This takes the conversation out of the public domain. It allows you get specific and have a conversation with the fan on what they think about your business and overall experience. To really help boost loyalty amongst your brand ambassadors, you can choose to reward them for this feedback via discounts, promotions, or even by spotlighting them on your social channels. This level of recognition will show your ambassadors that you value their input. When gathering feedback from your fans, it’s important to filter through the comments and data. Not all activity and comments from your fans will translate into new changes your business needs to take. That’s why, when looking at social media insights and comments, you must identify the key trends in both behavior and conversations to help determine what your social media community really wants. Implementing these changes will then ensure your business has created an experience in line with customer demand and behavior. Ravi Shukle is a social media and online customer service expert. He loves to help online businesses effectively manage their customers using social media and email, helping to boost loyalty & sales. He reveals all his latest training tips, resources, and strategies in his five-star community here.